As any concerned parent should, you care about the health of your child. You want to ensure your child is eating right and getting exercise, so they practice healthy habits and maintain them in the future. Here is a checklist you can follow to guarantee that. Find creative ways to make healthy eating fun. Sneak vegetables into tomato sauce or make a fruit smoothie. Tell a story about their favorite character and how much they love eating fruits and vegetables. Get creative with educating them about nutrition. Use their favorite plate to demonstrate MyPlate guidelines. Place apple slices on the plate and help them count how many there are. Promote artistic creativeness by letting them decorate a pancake with fruit and honey. There’s nothing wrong with playing with your food. If your child is old enough, have them help in the kitchen. This will give them hands-on experience, and they are more likely to eat what they make themselves. See what they can do to help and always supervise them, especially around heat and sharp objects. A big part of life is making compromises. Part of being a parent is enduring a child’s whining and begging, and eventually, temper tantrums. Negotiating benefits both parties and teaches your child a good way to go about conflict and situations. Say your son wants ice cream, but he hasn’t eaten dinner yet. Explain to him that having ice cream now might ruin his appetite. See if he’ll listen if you say he could eat ice cream after dinner, or you can go out for ice cream during the week. Another option is to give him something else he wants, that doesn’t involve food — you don’t want your child to equate food with a reward. 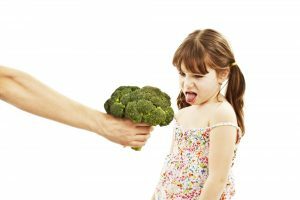 Say your daughter doesn’t want to eat broccoli. Ask why she doesn’t want it. If she keeps putting up a fight, say that she can try carrots or corn instead. Then she’ll still get dessert after while still eating her vegetables. First, leave the kids at home, or go grocery shopping when they are busy or in school. Kids will want to reach for the sugary cereal and snacks. You also don’t want to endure your child’s meltdown when you say no, nor do you want to risk losing them in the aisles. Read nutrition labels. Don’t fall for buzzwords like “natural” or “low-fat.” Look at the ingredients list, and if there’s anything you can’t pronounce, put it back on the shelf. Surprise your child by buying something new that you think they would enjoy and will expand their palette. Don’t go shopping when you’re hungry. This is a sure-fire way to buy anything and everything in sight, leading to sweets that the kids will want. Eating before you go will ensure you stick to the list and mainly buy healthy items. Follow an 80-20 rule — eighty percent will be nutritious foods, twenty percent will be reserved for a few treats. Playtime can easily turn into exercise. Think of all the chasing you have to do to keep up with your kid. It’s already a form of fitness — so might as well join them. During the summer, take advantage of the beautiful weather by going outside. Teach your child how to swim or ride a bike (age 5), so they can learn a new skill. Other options can be as simple as playing catch or taking a walk around the block. Invite your wife and older siblings to come along with you for family and fitness time. Don’t become lazy when winter rolls around; take your child to an indoor roller rink, ice skating rink, or indoor swimming. If you have a little one, take them to an indoor play place. Video games such as Just Dance, Wii Fit, and Wii Sports can get the whole family off the couch. You and your child will have so much fun playing that both of you will forget that you’re exercising. Children especially should be getting enough sleep. Unfortunately, little ones have the most energy, so wrangling them into bed is no easy task. Most times, a single parent puts the kid to bed, but it might need to be a two-person job, especially if you have more than one. Buy a few children’s books for bedtime stories. Let your son or daughter choose which story they want you to read, and if they’re old enough, have them help you read it. Play soothing music in the background to promote peaceful sleep. And if they want some cuddle time, man up and do it. If your child is already attached to technology, have them turn off their devices at least an hour before getting shut-eye. If you’re on the phone or laptop late into the night, it will be more difficult to get to sleep because of the bright light from the screen, which makes your brain think it’s daytime and hard to power down for sleep. Set a curfew for technology and stick to it. 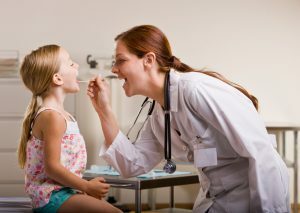 It’s crucial for children to visit their pediatrician frequently. After your child’s second birthday, set an appointment for a checkup once a year. Checkups consist of checking their height, weight, blood pressure, and other routine things. Yearly checkups are essential for evaluating a child’s growth and development. It will be easier to prevent diseases if the doctor is keeping a close watch, especially if certain diseases run in your family. Remember to vaccinate your child as well. Be there (if your wife is not, better yet go together with your child) to ask any questions you may have for the doctor. Monkey see monkey do — children are likely to copy the behaviors of those they admire. If you practice healthy habits, and your son or daughter sees you do so, the better chance he or she will pick up on them. Children are likely to learn visually rather than from talking. They prefer to use their eyes and hands rather than their words. The next time the family sits down for dinner, scoop up more salad onto your plate. If they see dad has more salad, perhaps they will want to salad for themselves. Not only will you be encouraging healthy habits for your child, but for yourself. As your child starts learning about keeping good health, so will you. 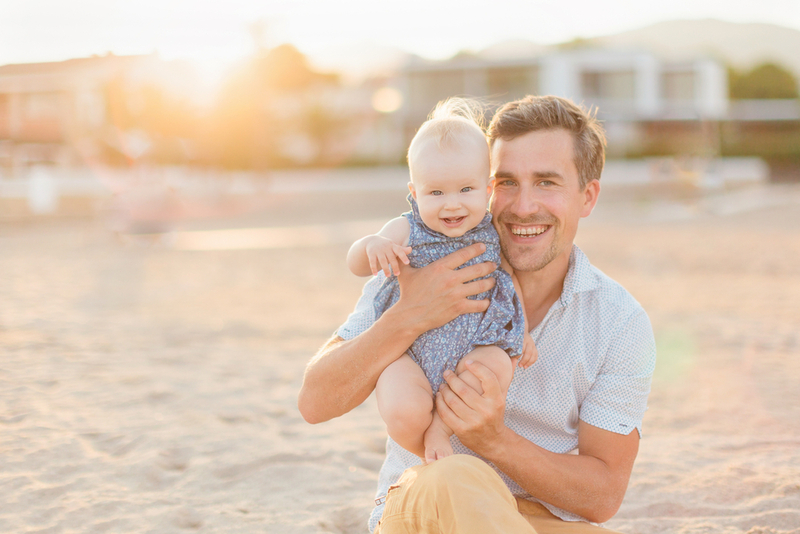 Your son or daughter may even serve as motivation for your health goals. This is a way to physically better each other as well as strengthen your relationship with them.